Why Do Cats Like Boxes So Much? Felines have a similar strategy to hunt in the wild which is hiding and stalking the prey before running or pouncing to kill it. A box provides the enclosure the cat needs to follow its instinct of watching and hunting. That is what a cat’s ancestor would do in the wild in a den, cave or tree hole, observe the pray and pounce to catch it and kill it. This instinct of hiding and hunting becomes a great opportunity to play with the cat, providing toys that will be the prey for the cat to hunt. 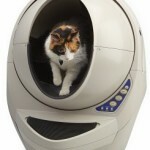 Indoor cats live in an wide open space at home and they need small hiding spaces to feel safe and secure. 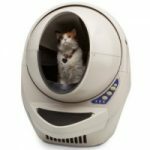 An enclosed area allows cats to feel protected and provide a spot to hide in case an unexpected stressful situation happens. When a cat is inside a box, it feels like it’s invisible somehow and this helps to cope with anxiety and stress. The box also provides an area for the cat to snuggle, feeling comfortable, safe, like a kitten with its mother and litter mates. 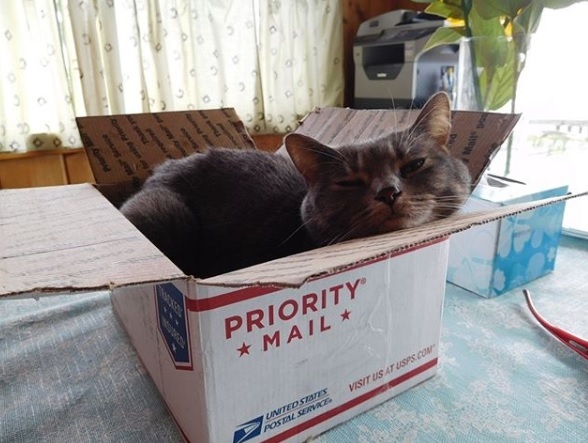 A study of the University of Utrecht in Holland concluded that boxes help cats to adapt to new environments much better than cats without a box. They introduced 19 new cats in a shelter, dividing two groups, one group of 9 cats without a box and 10 cats with a box. They assessed the stress level or both groups by observing the behavior during a 14-day period using the Turner Cat-stress-score (CSS). They concluded that the cats with a box where able to adjust to the stressful situation much better than the cats without a box and recover much faster in their new environment (source). The lack of hiding places in multi-cat environments make cats to start using the litter box as a protective place, developing behavioral issues such as a cat sleeping in its litter box. The ideal temperature for cats is not always the same for humans. 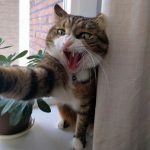 Cats body temperature is higher than humans (100.5 to 102.5 degrees) so they adapt their body temperature to the environment in different ways, sunbathing with the sunlight they get from windows, looking for high places in the house where the heat rises or curling up inside a small box. Small boxes provide cats the walls they need to support their body and at the same time to ball up, retaining more heat if they feel chilly. Cardboard has insulting properties which helps to retain the heat longer, keeping the cat warm. Scratching is an instinctive behavior that involves territorial marking. The cat’s paws have scent glands with what the cat marks its scent, claiming that area as part of its territory. Also, when the cat scratches spends energy through exercising. 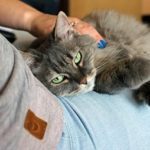 The scratching activity allows the cat to stretch, pull and work the muscles, the more energetic the scratching, the more energy the cat is spending and the better it feels. Scratching makes cats feel good. What’s the best type of box? Any cardboard box will do the trick for your kitty. Just make sure to eliminate any attached object from the box before placing it on the floor. Do you want a tip? Banana boxes are a great fun for cats! I use a banana box with my cat Sophie and she loves it! As this type of box has different holes on the walls you can stick a toy or play with a wand teaser through the holes and your cat will try to catch it.